We've been thinking about getting a dog for ages, but it's been difficult to work out the logistics when we've been travelling so much. Well, today's the day! 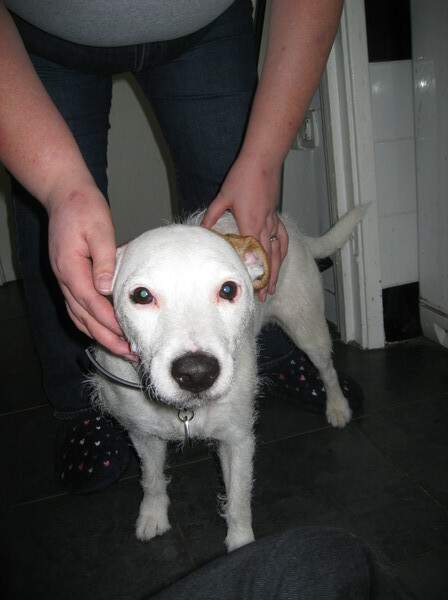 Pepper is a Parson Russell Terrier, and she's 3 years old. We just collected her from the lovely people at Wood Green Animals Shelter. Her previous owner passed away recently, so she was looking for a new home. We've just brought her home and things are going great - she's very well behaved (so far!) and is loving a new place with lots of fuss and cuddles. what a noble thing to do. no human should be without a dog and adopting from a shelter is the finest way to get them. i rescued mine very directly, from the street, but that's in a different country where there are very few shelters. So nice of you to adopt one! Good luck with her.